Eukanuba Veterinary Diets Restricted Calorie for Dogs is a complete dry food to help overweight dogs achieve their optimal body condition. It is low in fat whilst maintaining an appropriate protein level to ensure that muscle loss does not occur. It is enriched with joint supplements and is suitable for use in dogs who need to lose weight to help with mobility problems. 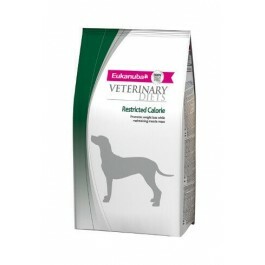 Eukanuba Veterinary Diets Restricted Calorie for Dogs is a complete pet food for dogs, it is intended to help reduce excessive body weight. It has been formulated with a low energy density and also includes L-Carnitine, which is a key nutrient for improved fat metabolism. This food can be used to help to manage weight and achieve an ideal body composition. The addition of glucosamine and chondroitin sulphate will help support and nourish healthy cartilage in joints. This food is also available in a wet form.